If you're a man of a certain age you'll know there comes a point in life when getting a sports car and over-analysing your contribution to society sounds like a really good idea. With a good job in sales and marketing and a nice house in Manchester that he shared with his wife and kids, John Bishop was no different when he turned the dreaded 4-0. But instead of spanking a load of cash on a car that would have made him look like a senior stylist at Vidal Sassoon, he stumbled onto a pathway that ultimately lead him to become one of the nation's best loved comedians. It was a gamble, but boy, did it pay off. How Did All This Happen? is the story of how a boy who, growing up on a council estate dreaming of ousting Kenny Dalglish from Liverpool FC's starting line-up, suddenly found himself on stage in front of thousands of people nationwide, at an age when he should have known better. 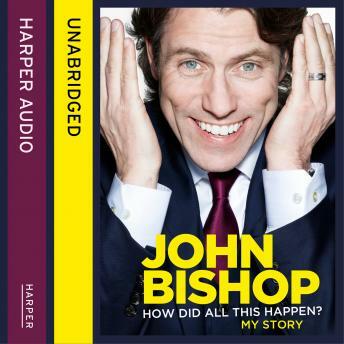 In his own inimitable style, John guides us through his life from leaving the estate and travelling the globe on a shoe string, to marriage, kids and the split that led him to being on a stage complaining to strangers one night - the night that changed his life and started his journey to stardom. Wonderfully entertaining and packed with colourful reminiscences and comical anecdotes, this is a heart-warming, life-affirming and ultimately very, very funny memoir from one of the nation's greatest comedians.